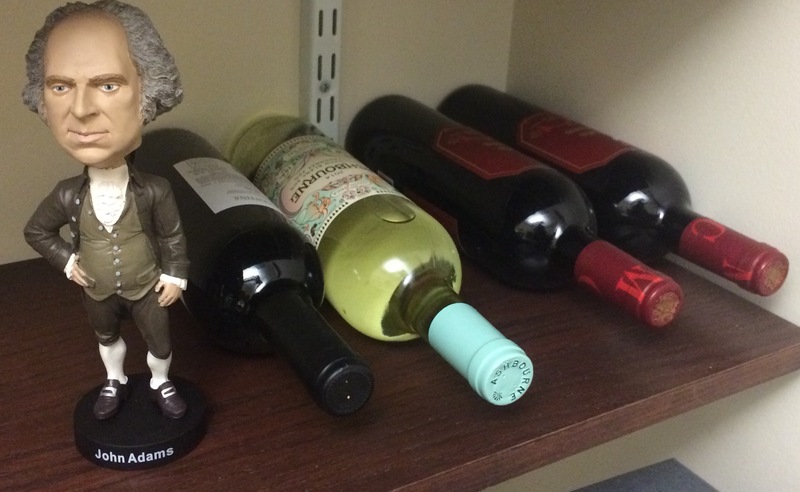 Happy 280th birthday to President John Adams: lawyer, statesman, and…wine connoisseur? He began a crisp New England morning like today with a tankard of hard cider, but Adams’ years in Europe primed his palate for fine French wine. Once abroad, dining in Paris and Amsterdam, Adams came to savor the heartiness of a robust red, or the exotic delight of a white Bordeaux. He was new to the world of wine, and his wine habits tell us how American taste changed as revolution segued into republic. There were fits and starts of grape-growing in Pennsylvania and California between 1740 and 1770, but America’s first commercial vineyard did not flourish until 1798. Under the guidance of John Dufour, it had mostly withered away by 1809. In the antebellum period, Adam’s sometimes-friend Thomas Jefferson and others grew fascinated in the agricultural improvements and industrial techniques of wine-making, a popular interest that coexisted in the early republic with the onset of the temperance movement. By 1830, Nicholas Longworth had set the American wine business back in motion, using the Catawba grape to produce a range of popular sparkling wines. The time he spent in France, reunited with wife Abigail and family, marked one of the happier parts of his diplomatic career, and even the prickly Adams celebrated—in moderation. At Auteuil and later, at the Grosvenor Square legation that doubled as the American minister’s residence and headquarters, John and Abigail served a range of wines that complemented the likes of turtle soup and apple pan dowdy. Good claret also gave Adams a much-needed respite from the coffee-and-tobacco, tea-and-cards-fueled meetings that comprised his diplomatic mission there. As America’s difficult peace with Britain took hold, John Adams perceived the importance of the wine trade to the young nation’s future. A perennial fan of Madeira, Adams agreed with Robert R. Livingston, who stated in 1783 “that Madeira, was esteemed above all other wine.” As a beverage for all seasons, Livingston noted “that it was found equally wholesome and agreeable in the heats of Summer, and the Colds of Winter, So that it would probably continue to be preferred, tho there was no doubt that a Variety of French Wines would now be more commonly used than heretofore.” And so, a birthday toast to John Adams!